I tend to use the Windows 7 and Windows 8 embedded snipping tool a lot for partial screen and image grabs. I tell my customers to use it�to capture the error message or blue screen error diaglog so I see exactly what the error relates to. To get the snipping tool up you can type “snip” into the search box off the start orb or start key on the keyboard (that’s the one with the flag lower left). 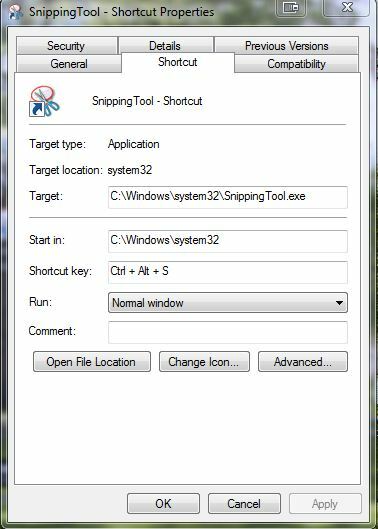 Snipping tool will appear, from here you can click or press enter to launch the tool and take a screen grab, or right click and pin it to the taskbar. I have been using it off the taskbar but with so many items on the taskbar I prefer to ctrl+alt+S to launch. To do this for snipping tool, or any other program, first of all test the ctrl+alt+theKeyYouWantToUse to make sure you are not overriding another shortcut. Now ctrl+alt+S will open the snipping tool. You are currently browsing the Wired Office weblog archives for April, 2013.